Mt. Fuji, Japan’s highest mountain, is definitely one of the symbols of Japan. It has been respected as a spiritual place by Japanese people since ancient times. Its natural beauty has inspired Japanese literature, arts and culture, and Mt. Fuji was registered as a World Heritage Site in 2013. Autumn leaves come from north because they need low temperature to turn red and yellow. 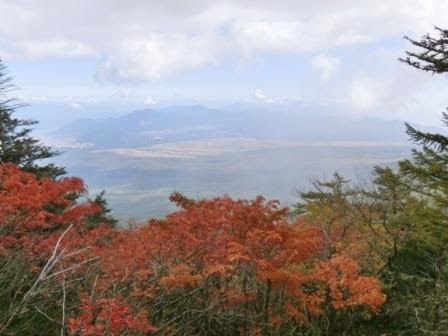 Then, even if the place is not located in Northern Japan, if it is a cold place, fall foliage starts early. That’s why Mt. Fuji’s hillside welcomes autumn leaves in early to middle of October. 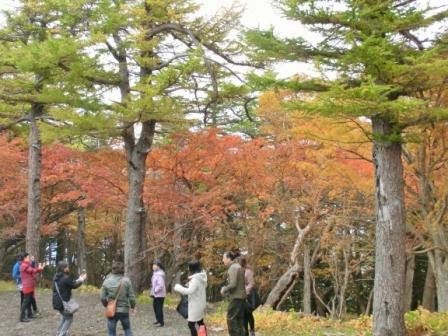 In Lake Kawaguchi, Autumn Leaves Festival starts on 1 November. At the observatory of the 5th Station of Mt. Fuji, you can see the deep forest and the town. And just in front of us, a lot of beautiful red and yellow trees make us feel Japanese autumn. I’m going to write about attractions at the 5th Station of Mt. Fuji hillside in the next post, and this post refers to fall foliage there. Leaves start to turn red and yellow in early October and they are at the peak in the middle of October. You see, everyone is happy with autumn leaves! Details for sightseeing in Mt. Fuji 5th Station will be in the next post, but if you hope to go up there, you’ll go a highway called Fuji Subaru Line on a bus. Never sleep on the bus! Subaru Line is part of Mt. Fuji, so the nature seen from the bus windows is beautiful. I got the very front seat to enjoy the scenery through the front window of the bus driver. The photo is just one of my pictures. I enjoyed fall foliage all the time on the way. If you are very very lucky, you’ll meet some animals such as Japanese deer. They are shy, but surely inhabit in the forest of Mt. Fuji. The bus is non-stop because it’s a highway, so it is not very easy to meet the shutter chances. But the views are undoubtedly attractive, and there were some photo-freaks holding their favorite camera. How bright the peak of Mt. Fuji is! The peak gets some snow in the middle of October, which makes Mt. Fuji as its well-known style of Japan’s icon. So this is the first post about a trip to Mt. Fuji as I planned for this autumn. Happy if you enjoy it! I’ve uploaded some photos on Flickr of Tokyo Direct Diary, so see and share them while waiting for the next post about the attractions of the 5th Station of Mt. Fuji hillside! Yamanashi Prefecture is neighboring to Tokyo. Right west from Tokyo. Fujikawaguchiko Onsen Konanso – A 5-star, traditional style, lakeside hotel. Convenient to go to attractions and Lake Kawaguchi Station, too. Shuhokaku Kogetsu – Expect to see Mt. Fuji itself and Mt. Fuji Reflected on Lake Kawaguchi on calm sunny days. breathtaking views.